In 1988, the International Headache Society first published a detailed classification of headache. This classification has been updated and revised multiple times, most recently in July 2013 with the publication of the International Classification of Headache Disorders, 3rd edition.1 All headaches can be classified as either a primary headache or as a secondary headache, which is defined as a headache that is caused by an underlying disease process or medical condition. Primary headache disorders are the most common. This discussion will focus on the diagnosis and management of the most common primary headaches. Primary headaches disorders are not associated with any demonstrable structural abnormality of the brain. The diagnosis of the headache type is based on patient history, headache characteristics, and a normal neurological exam. Laboratory and imaging test results are normal, so in general, expensive studies like imaging are not obtained. During the headache attack, however, patients with cluster and migraine headache may have some abnormal clinical findings. Primary headache disorders typically occur early in life with a decreased incidence of new primary headache disorders after the age of 40 to 50. Secondary headaches are usually of recent onset and associated with abnormalities found on clinical examination. Laboratory testing, imaging studies, or both confirm the diagnosis. Recognizing headaches related to an underlying condition or disease is critical not only because treatment of the underlying problem usually eliminates the headache, but because the condition causing the headache may be life-threatening. Central sensitization occurs during this process. Neurons become upregulated and sensitized to both nociceptive and non-nociceptive stimuli. This in turn causes peripheral sensitization where pain receptor fields are enlarged causing increased sensitivity to both noxious and non-noxious stimuli. Allodynia and exacerbation of pain by physical activity is thought to be caused by this process. The pathophysiology of cluster headache is poorly understood, but is believed to be caused by activation of the posterior hypothalamus with secondary activation of the trigeminal autonomic reflex through the trigeminal-hypothalamic pathway.13 Severe, unilateral pain is mediated by activation of the first division of the trigeminal nerve (V1). The autonomic symptoms associated with cluster headache (lacrimation, miosis, sweating) are thought to be due to parasympathetic outflow from the superior salivatory nucleus via the pterygopalatine (sphenopalatine) ganglion. Migraine is an episodic headache that lasts between 4 to 72 hours and fulfills the criteria established by the ICHD as shown in (Table 1). Most patients with migraine do not have an aura, but when an aura occurs, it is defined as migraine with aura. Visual aura is most common and accounts for 90% of aura. This is typically a fortification spectra: zigzag lines that move across the visual field. Many different auras have been described: scintillating scotoma, kaleidoscope vision, pixelated vision, “orbs in the sky” to name a few. These last from 5 to 60 minutes and are followed by the headache. On occasion, these occur without headache. Sensory disturbances are the second most common aura (pins and needles sensation, numbness) usually affecting the face and arm. Language disturbance (aphasia) is unusual as is motor weakness. When motor weakness occurs, it is classified as hemiplegic migraine. When vertigo, ataxia, diplopia or other brain stem symptoms occur, it is classified as migraine with brainstem aura. Other prodromal symptoms such as yawning, irritability, neck pain, food cravings, burst of energy, or fatigue may occur hours to days preceding the migraine. Tension-type headache is best described as a mild to moderate, featureless headache. The ICHD definition of tension-type headache is presented in (Table 1). Cluster headache is the most common of the trigeminal autonomic cephalalgias and has been described as the “suicide” headache due to its severity. These are attacks of severe unilateral pain, occurring in and around the eye or temple and are associated with ipsilateral conjunctival injection, lacrimation, unilateral sweating, ptosis, or miosis (see Table 1 for ICHD definition). Attacks last 15 to 180 minutes, and may occur once every other day to 8 times a day. Patients are restless or agitated, and may pace or rock to try and relieve the pain. Pain often occurs 1.5 to 2 hours after the patient falls asleep, corresponding to the onset of the first REM cycle of sleep. Attacks often occur in patterns: spring and fall, around the time of the equinoxes. This is thought to be related to circadian rhythm. Alcohol is a potent trigger of the headache when a patient is in a cluster headache cycle. It does not trigger an attack outside of a cluster cycle. 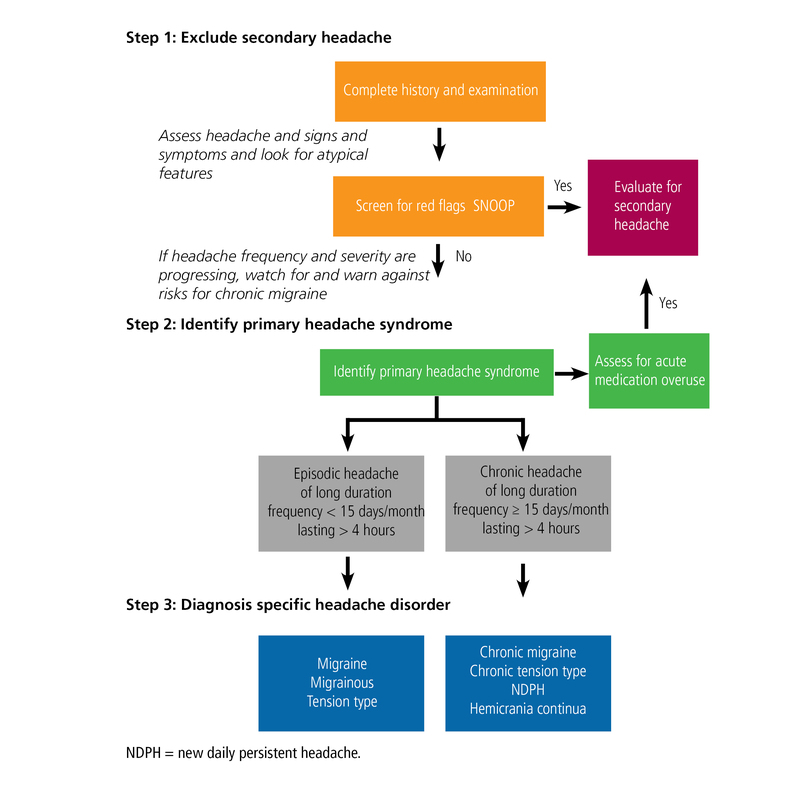 The steps to headache diagnosis are presented in (Figure 2). The first step is to always exclude a secondary headache. Excluding a secondary headache may require a laboratory evaluation or imaging or both. Primary headache disorders have a normal neurological exam. First and the worst headache of life. Headache that reaches pick intensity within seconds to minutes. New onset of headache in someone after the age of 40. In general, primary headache disorders begin in young people. Educating the patient on migraine and its management is crucial for effective treatment. Treatment is usually a combination of general preventative measures, prophylactic treatment, and abortive treatment (Figure 3). General preventative measures include maintaining a headache diary to identify and avoid triggers, limiting use of acute treatments (over-the-counter medications, triptans, etc.) to no more than 2 days per week or 10 days per month to prevent medication overuse headache (rebound headache), following a regular schedule (including weekends and holidays), not skipping meals, eating a balanced diet, getting 8 hours of sleep nightly, minimizing stress, exercising 30 minutes per day, keeping hydrated and drinking 6 to 8 glasses of water daily. Always treat early in the attack before the headache progresses in severity. Whenever possible use migraine-specific medications such as triptans or dihydroergotamine. Contraindications are uncontrolled hypertension, cardiovascular and cerebrovascular disease. Use a formulation based on migraine characteristics: nasal spray or subcutaneous formulation in someone with rapid onset headache or who has nausea and vomiting from the onset. Nonsteroidal anti-inflammatory drugs (NSAIDS) are useful alternatives when triptans are contraindicated. Avoid opioids and butalbital containing compounds since these are not only addictive, but rapidly cause medication overuse headache (MOH). Do not use abortive medications more than 10 days per month to avoid MOH. There are several reasons to consider daily medication to prevent migraines should. Prophylaxis should always be used when migraine significantly interferes with an individual’s daily routine, despite acute treatment or if the frequency of attacks are more than 1 a week. Certain uncommon migraine conditions, such as hemiplegic migraine, always require preventative treatment. Always start with a low dose of medication and increase gradually to minimize side effects. An adequate trial duration of therapy is 6 to 8 weeks at the target dose. Manage patient expectations because there is no quick fix and the goal of prevention is a 50% reduction in intensity or frequency or both. Encourage patients to use a calendar to accurately assess treatment benefits and evaluate efficacy. Taper the medication and discontinue it if headaches are well controlled. Instruct women about the need for birth control as many of migraine drugs are contraindicated in pregnancy. Always consider a patient’s comorbid and coexistent illnesses and disorders. One medication may be able to be used to treat concurrent disorders (Table 2). The only medication specifically developed for the treatment of migraine is erenumab-aooe (Aimovig). Currently, there are 3 additional drugs targeting the calcitonin gene-related peptide receptor in phase 3 clinical trials (fremanezumab, NCT03308968; galcanezumab NCT03559257; eptinezumab). Management of tension-type headache begins by identifying and managing possible triggers and comorbid conditions. Analgesics such as acetaminophen and NSAIDs are usually considered to be first-line treatment for acute tension headache episodes. Combination analgesics, which combine caffeine with first-line drugs should be used as an option if analgesics alone are inadequate. Avoid use of barbiturate and opioid medications due to abuse potential and risk of MOH. Always limit use of medication to no more than 2 days a week or 10 days a month to avoid MOH. If tension headache occurs more frequently, prophylactic medication or alternative management strategies such as cognitive behavioral therapy, physical therapy, or acupuncture may be employed. In general starting with a low dose of medicine and slowly titrating to an effective dose is the best strategy for success. Always use the smallest dose of medication necessary to prevent the headache. Tricyclic antidepressants, such as amitriptyline or nortriptyline, are first-line therapy. Serotonin and norepinephrine reuptake inhibitors, such as venlafaxine, may be used as an alternative therapy. The main goals for management of cluster headache are to resolve the attack quickly and induce rapid remission of the episode. Management is always done concurrently with both abortive and preventative medications. Rapid control of a cluster headache cycle with a bridge between abortive and preventative medications can be done in a number of ways. Occipital nerve blocks involve the injection of a steroid with local anesthetic into the occipital nerves. Greater occipital nerve block is done ipsilateral to the attack using either betamethasone or triamcinolone with bupivacaine 0.5%. A study by Ambrosini et al,20 found 85% (11/13) of patients with cluster headache injected with lidocaine + betamethasone were attack free at 1 week compared with patients injected with lidocaine + saline (n = 10) reporting no freedom from pain. At 4 weeks, 61% (3/13) of patients given lidocaine + betamethasone had sustained headache relief compared with no relief for patients in the lidocaine + saline group. High-dose systemic steroids can be given over a course of 10 days to 2 weeks. Either prednisone 60 mg to 80 mg or dexamethasone should be used. A Medrol dose pack does not provide a high enough dose or a long enough duration to be of benefit. Dihydroergotamine using a modified Raskin protocol21 can be done on an outpatient basis. The patient can be taught how to give a self-injection or the use of nasal spray to administer 1 mg every 8 hours for 3 to 5 days. Abortive therapy for cluster headache includes high-flow oxygen (10 to 15 L/min) via rebreather mask for 15 minutes, subcutaneous dihydroergotamine or sumatriptan, or zolmitriptan 5 mg nasal spray. The oral agents work too slowly to be of benefit to abort a cluster headache. Preventive treatment for cluster headache is with verapamil 80 mg 3 times daily to 160 mg 3 times daily. Higher doses may be necessary and an electrocardiogram should be done prior to dose escalation above 240 mg per day because of QTC prolongation. The addition of valproate or topiramate to verapamil is sometimes necessary. For chronic cluster headache, lithium is also used. Thyroid function should be monitored for patients taking lithium. Headache diary, disability or the migraine-specific quality of life questionnaire to monitor response to treatment. Headache Classification Committee of the International Headache Society. The international classification of headache disorders, 3rd edition (beta version). Cephalalgia 2013; 33(9): 629–808. Bendtsen L, Jensen R. Tension-type headache: the most common, but also the most neglected headache disorder. Curr Opin Neurol 2006; 19(3):305–309. Schwartz BS, Stewart WF, Simon D, Lipton RB. Epidemiology of tension-type headache. JAMA 1998; 279(5):381–383. GBD 2016 Disease and Injury Incidence and Prevalence Collaborators. Global, regional, and national incidence, prevalence, and years lived with disability for 328 diseases and injuries for 195 countries, 1990–2016: a systematic analysis for the Global Burden of Disease Study 2016. Lancet 2017; 390(10100):1211–1259. Agosti R. Migraine burden of disease: from the patient’s experience to a socio-economic view. Headache 2018; 58(suppl 1):17–32. Lipton RB, Stewart WF, Diamond S, Diamond ML, Reed M. Prevalence and burden of migraine in the United States: data from the American Migraine Study II. Headache 2001; 41(7):646–657. Fischera M, Marziniak M, Gralow I, Evers S. The incidence and prevalence of cluster headache: a meta-analysis of population-based studies. Cephalalgia 2008; 28(6):614–618. Charles A. 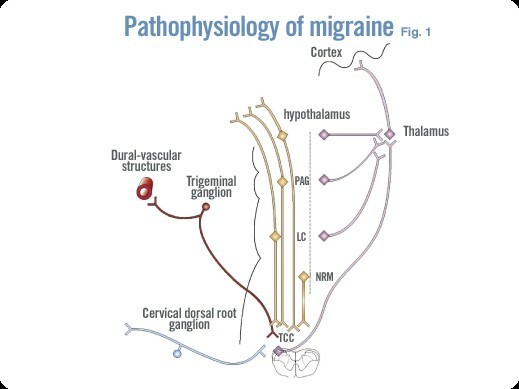 Advances in the basic and clinical science of migraine. Ann Neurol 2009 ; 65(5):491–498. Gursoy-Ozdemir Y, Qiu J, Matsuoka N, et al. Cortical spreading depression activates and upregulates MMP-9. J Clin Invest 2004; 113(10):1447–1455. Bendtsen L. Central sensitization in tension-type headache—possible pathophysiological mechanisms. Cephalalgia 2000; 20(5):486–508. May A. Cluster headache: pathogenesis, diagnosis, and management. Lancet 2005; 366(9488):843–855. Martin VT. 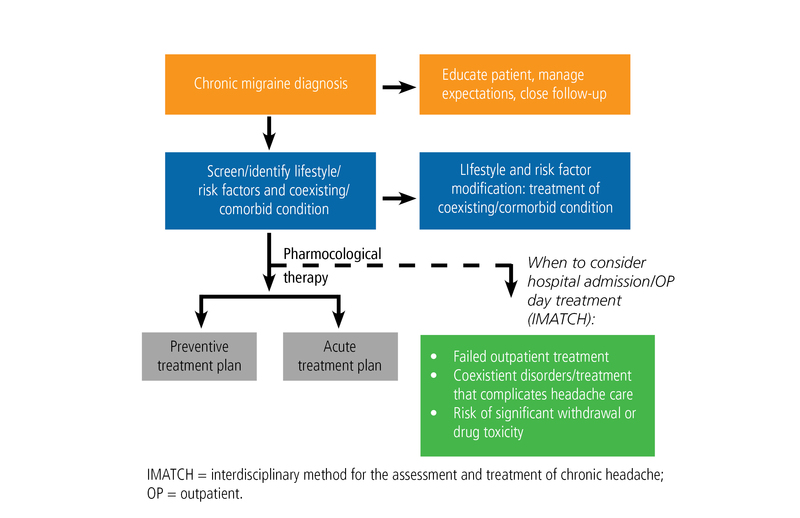 Simplifying the diagnosis of migraine headache. Adv Stud Med 2004; 4(4):200–207. Silberstein SD; for the US Headache Consortium. Practice parameter: evidence-based guidelines for migraine headache (an evidence-based review): report of the Quality Standards Subcommittee of the American Academy of Neurology. Neurology 2000; 55:754–763. Drugs@FDA: FDA Approved Drug Products. U.S. Food & Drug Administration website. https://www.accessdata.fda.gov/scripts/cder/daf/index.cfm. Accessed September 18, 2018. Katsarava Z, Schneeweiss S, Kurth T, et al. Incidence and predictors for chronicity of headache in patients with episodic migraine. Neurology 2004; 62(5)788–790. Silberstein SD, Holland S, Freitag F, Dodick DW, Argoff C, Ashman E. Evidence-based guideline update: pharmacologic treatment for episodic migraine prevention in adults: report of the Quality Standards Subcommittee of the American Academy of Neurology and the American Headache Society. Neurology 2012; 78(17):1337–1345. Holland S, Silberstein SD, Freitag F, Dodick DW, Argoff C, Ashman E. Evidence-based guideline update: NSAIDs and other complementary treatments for episodic migraine prevention in adults: report of the Quality Standards Subcommittee of the American Academy of Neurology and the American Headache Society. Neurology 2012; 78(17):1346–1353. Ambrosini A, Vandenheede M, Rossi P, et al. Suboccipital injection with a mixture of rapid- and long-acting steroids in cluster headache: a double-blind placebo-controlled study. Pain 2005; 118(1-2):92–96. Evans RW. An update on the management of chronic migraine. Pract Neurol 2013; Nov-Dec:27–32.